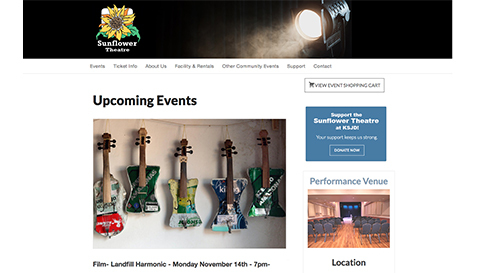 For the KSJD Sunflower Theatre in Cortez, Colorado, Cortez Web Services built a website to showcase their live events and manage ticketing. For this project, we developed a custom theme to match the branding of the Sunflower Theatre’s parent organization, KSJD Community Radio, to create a seamless cross-website experience for those navigating back and forth between the two sites. The website design was built around a ticketing system and event management software to handle online ticket sales. The event management system comes with some great advantages: by keeping tickets sales “in-house”, they’re able to get even more out of conversion. While many organizations choose to use a 3rd party event management service to handle ticket sales, this can cost them a significant portion of the transaction amount. Through the use of premium event management software that’s actively supported by the developer and installed in the Sunflower Theatre website, the non-profit organization has more control over their ticket sales, transactions, and website content. Another benefit of in-house transactions is the retention of their customer info and donor data which can be easily exported into their CRM database. By posting content about the events on their website, they’re able to keep their customers on the Sunflower Theatre website for longer, instead of sending them to another site to complete the transaction, which can also help with search engine optimization and conversion. That means more dollars for this people powered non-profit organization in our community.